Councilmembers take another look at whether to hire private help for filling potholes this season. OMAHA, Neb. (KMTV) -- — Councilmembers take another look at whether to hire private help for filling potholes this season. The Omaha City Council approves a plan to use $450,000 to have private contractors help with pothole repairs . On January 29 they voted to deny the request, but this time Councilman Rich Pahls changed his vote. The Public Works Department says they need the flexibility to get the work done quickly at peak times. Last year, they say in one month they had 4,000 calls for repairs. Some drivers say it’s needed. 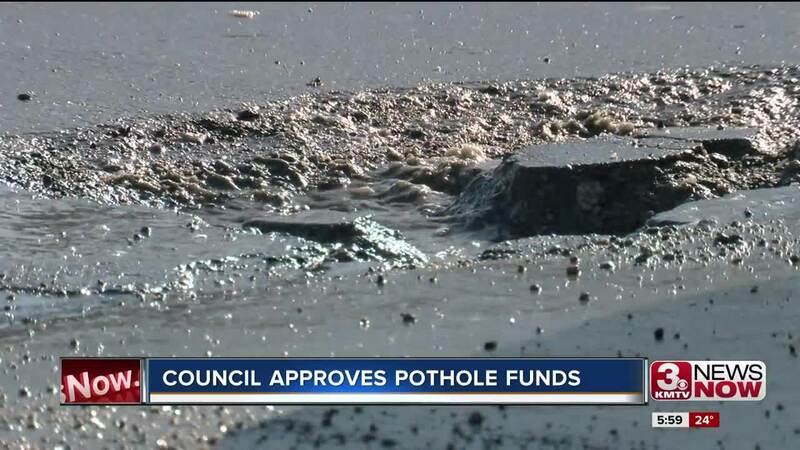 "It's really causing a lot of damage to people's cars and like it's not fair because then we have to go and pay for all of these damages and we're paying taxes for all these potholes that are really not supposed to be there,” said Marissa Ellenwood of Omaha. Two unions opposed the idea because it would take money and overtime away from city employee, but public works says they’re overworked and aren’t volunteering for overtime. Though the vote was approved the council continued to be concerned with why so many road crew workers were not staying with the department, and what they can do to fix that hole. "The administration has acknowledged understaffing and that's greatly concerning to me with pothole season upon us. I would greatly prefer our employees are doing the work for themselves and I think they're up to that task, but I think we're in a spot right now where it's mid-February and I don't know that we have an option," Councilman Pete Festersen explained.